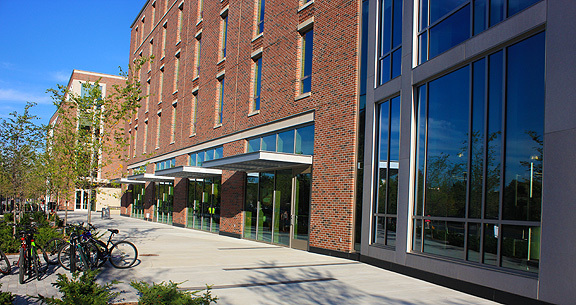 Project obstacles and solutions: Purdue University has opened new dorm space that supports a sustainable lifestyle for students living on a large campus. This includes designing multi-use residential dorms with both retail space and teaching/study rooms in the same building. Both the Third Street Suites and the Vawter Field Housing for upperclassmen were planned with the input of students and faculty. The buildings set adjacent to each other. Each of them house retail businesses on their first floors, with students suites in the upper four floors. These two multi-purpose housing units are the centerpiece of the future of on-campus housing. Beyond its retail and residential function, the entire project was designed for urban college lifestyles. A big part of that was the hardscapes surrounding both buildings. J.R. Kelly provided all of the exterior concrete work on these projects. The architectural design called for a black colored concrete inset throughout the sidewalks. Typically this would be achieved with a shake-on color or stain applied to portions of the larger slab. In this case, J.R. Kelly chose to go the extra step of doing a separate pour for each of the insets. IMI supplied integrally colored concrete for the insets. The two buildings opened in the fall of 2014. Both projects were awarded LEED Silver status. For more information on colored concrete from IMI, click here.